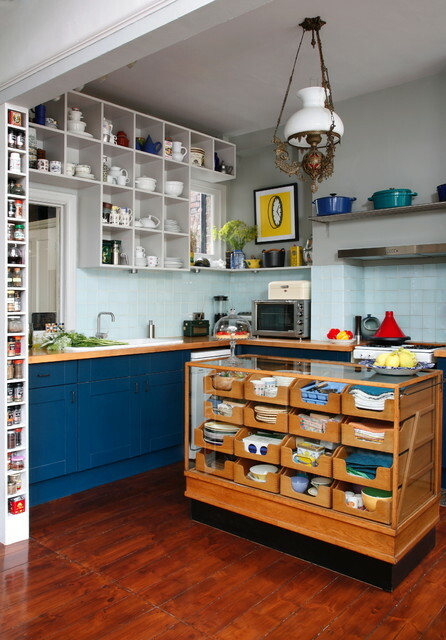 Play with unusual furnitureYou might not expect to find a reclaimed vintage haberdashers’ unit in the kitchen. Here, however, a fine example has been repurposed as a beautiful – and highly functional – kitchen island, with plenty of space to stash cutlery, linens and crockery. A special toughened-glass top has been added by the owners so it can be used for chopping and dicing, too. It’s much more characterful than a pristine block of white marble. Introduce vintageDon’t overlook the opportunity to bring pre-loved furniture into a kitchen. While new cabinets that have been professionally fitted deliver practical benefits, a vintage piece can work equally well and will add a shot of unique character and style. Try a simple wall cupboard or make a bigger statement by sourcing a large piece like this old display cabinet from a department store, which now functions as storage and an alternative island.